The New Life Festival is a holiday event that typically takes place in the month of December and January. During this event players can obtain a 100% XP buff and the opportunity to acquire a collection of New Life Festival-themed items. The festival also has a special quest associated with it, named The New Life Festival, which repeats every year. A notable feature of the event is the inclusion of New Life Gift Box — special reward containers that grant players various event-themed items. For background information on the festival, see the lore page. This box contains gifts that many celebrants would find of interest. For completing a subsequent daily quest, you will receive one New Life Festival Box. Each Gift Box contains a guaranteed sample of Wolfsbane Incense, as well as a selection of items related to the New Life Festival. This includes unique recipes, provisioning ingredients, Skinchanger motif pages, or rare collectibles. All of these items can be traded with other players. Rewards vary slightly each year as detailed below. New Life Gift Boxes can be obtained as a quest reward from Breda at the revelers' tent, just south of Windhelm. Each quest can be completed once a day, granting a maximum of 9 boxes per day, per character. Completing all nine activities unlocks the New Life Cerulean dye. In addition, activating Breda's Magnificent Mead Mug memento or drinking Breda's Magnificent Mead from the keg near Breda will net you double XP for two hours. The New Life Festival 2018 will run from December 13, 2018 to January 2, 2019. As an incarnate nature spirit, an Indrik first appears in its comparatively drab Nascent form before somehow differentiating into one of their more splendid variations. The New Life Festival is the fourth opportunity for players to work towards obtaining the Nascent Indrik mount. During the event, the Opaline Indrik Feather is introduced and can be purchased with ten Event Tickets, which players can acquire from completing daily quests from Breda. Completing any quest will reward players with one Event Ticket per account per day. Once ten tickets have been collected, they can be brought to The Impresario (located in Daggerfall, Davon's Watch, and Vulkhel Guard) to purchase the feather. "A direct request for a dozen simple furnishings, from the Orsinium Home for Displaced Children. Once accepted, this contract cannot be traded or sold. Completing 12 New Life Charity Writs will award you the Crystalfrost Skin." Charity Writs are special master writs that request a dozen simple furnishings, such as a Rough Bowl, Common or Stool, Carved. The blueprints, patterns and schematics for these furnishings can be bought from Crafting Vendors. Charity Writs can be obtained from New Life Gift Boxes, although the drop rate is relatively low. An ice-themed skin acquired by completing the "Newly Charitable" achievement, which involves completing 12 New Life Charity Writs. 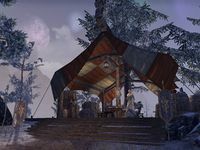 The following furnishing items can be bought from Heralda Garscroft in Elden Root, Wayrest, Mournhold or Vivec City if the associated achievement is unlocked. "Get small to go large: this miniature Snow Globe Home is tiny on the outside but expansive on the inside, proving shrunken real estate is a big bargain! And to make the interior cozier, the exterior features an eternally-festive gentle snowfall. Magical!" The Enchanted Snow Globe Home will be available to purchase for the first time. The 2017 New Life Festival ran from December 15, 2017, until January 2, 2018. Similar to the New Life Festival of 2016, this event featured the chance to earn New Life Boxes by completing daily quests. Drops from New Life Boxes included a new motif, special themed recipes, and furniture. The 2016 New Life Festival ran from December 15, 2016 and lasted until January 4, 2017. By completing the daily quests offered during this festival, players were able to find Skinchanger Style motifs, learn New Life Festival recipes, participate in parties for each Alliance race, and obtain exclusive collectibles. Completing the initial quest awarded the memento Breda's Bottomless Mead Mug, which could be activated repeatedly throughout the event to grant your character a 100% XP boost for two hours. Special Traveling Festival Merchants will appear during this event, and sell two festival consumables: High Hrothgar Festival Mints and Sailor's Warning Festival Grog. Sailor's Warning Festival Grog can also be earned by completing optional objectives during the daily quests. Partaking in the New Life Festival will unlock several Holiday Events achievements. Unlocking all achievements will reward you with the "Magnanimous" title. Zenimax 2018 Announcement - Celebrate the New Life Festival for bonus rewards & XP! This page was last modified on 24 January 2019, at 09:44.